I received my Bachelors (1982) and Masters (1986) Degrees from UC Davis in the field of Human Exercise Physiology. 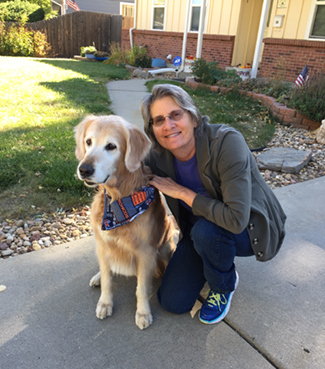 Following 18 years working in human cardiac rehabilitation, obesity treatment, clinical exercise, wellness programming, and clinical research, I embarked on my current career as a veterinarian. Much of the knowledge and experience from my previous career(s) compliment my education and training as a veterinarian, and I love drawing on my complete knowledge base and experience to provide the best care I can for animals. I received my DVM from UC Davis in 2004 and have practiced continuously in Winters CA, and surrounding areas. I love the challenge, both physical and intellectual, of providing veterinary care to a wide variety of species. There is never a dull moment in mixed practice! I began my own mobile veterinary practice in January 2010. My practice encompasses both ranch work (livestock, horses, working dogs, barn cats) and home visits (pet dogs and cats). I became a certified veterinary acupuncturist through the International Veterinary Acupuncture Society (IVAS) in 2010. Incorporating Traditional Chinese Veterinary Medicine (TCVM), Acupuncture, Herbs, and Diet Therapy into my practice has broadened my ability to treat a variety of issues for all species. There is a strong tie between TCVM theory and method and the principles I learned as an exercise physiologist. Being able to draw on all of this information allows me to provide better care to my patients and better service to my clients. Jake is my Office Manager, Goodwill Ambassador, Livestock Herding Assistant, Pet Therapy Partner, and all around Good Dog. He can be found riding shotgun with me on our daily rounds, providing a playful diversion to other ranch dogs, and offering comfort, support, and a gentle lick to upset people and animals. When needed, he is willing to convince my sheep and goat patients to gather and move so that we can work on them. Jake came to me after a 4-month stint in the Redding shelter, narrowly escaping the unthinkable, thanks to the wonderful dog-loving folks at 3R Rescue. He and I are still figuring out who rescued whom. Jake is an interesting mix of herding and hunting breeds, and when you see him you can make your best guess as to his lineage. 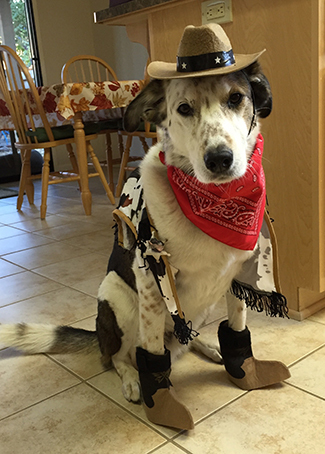 When not busy fulfilling his duties as a working dog, Jake stays busy with herding lessons, pet therapy appearances, and keeping up with his canine buddies. Jake is a registered therapy dog. We participate in a variety of animal-assisted-activities (AAA) for a number of organizations. A therapy dog is not the same as a service dog, and if you are interested, we would be happy to discuss the differences.